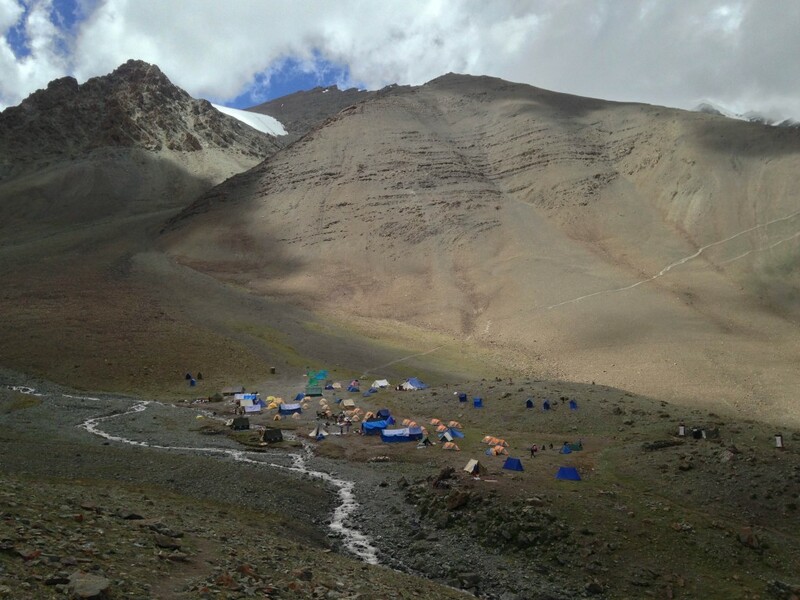 The 14 reached Base Camp Stok Kangri in intermittent intervals between 11.45am and 4pm. It took those with an easy continuous pace about 3 hours to 3.5. The rest had taken longer. But eventually everyone had made it. Life at base camp was no different than the halts we had taken over 2 days at Rumbak and Mankarmo. Except now, we had a scheduled acclimatisation climb at 5pm on a path which seemed snaky and on a hill which was deep brown in colour devoid of green. I reckoned the hike up would be another 600-800 feet at the most from our present altitude of 4970mtrs/16300 feet. From here on whatever trail I’d walk would be new. Physically I was fine. The body had yet to break in fully however and I was struck with a persistent irritating cold and a running nose, which wouldn’t go away despite the pills at night. The base camp had changed much since the last I’d been here. There were many more tents, North Face and Mountain Hardwear branded. Those circular yellow tents which reminded me of Base Camp Everest at its peak season. At night this setting would be pretty with each tent glowing with lights within. And what’s more, this base camp even had a ramshackle of a café tent branded ‘Mitra’. It was a dramatic change from what I remembered. It had truly become a circus, a fair. And we were part of it. The hike to the top of the hill took me 35 minutes and I was greeted with a superb view of the mountain. She was attractive as she rose high and stood tall and silent. Tomorrow night we would walk towards her and if everything went well and if she let us, we’d stand atop her summit. My mind had already raced ahead. The next milestone from here would be advance base camp at 5400mtrs/17712 feet, the ridge of the mountain at approx. 5854mtrs/19200 feet and eventually the summit at 6153 mtrs/ 20187 feet. On top of the hill at 17000 ft with Ketan, Kalpak and Biprashish. Stok Kangri looms large behind us. I had tossed and turned the entire night, much to the annoyance of my tent mate. Next morning I had woken up tired from my lack of sleep and the cold which refused to subside. The day would be long and interesting. We had to get our crampons and harnesses together, walk around with the crampons to get a feel. Word from other climbing teams had it, that snow boots (we had carried them with us) wouldn’t be required. Our trek boots with crampons would be sufficient. 7 of our team mates, meantime had decided to head back to Leh. Two weren’t well and so the decision was that all of them would be together. It was their first time in the Himalayas, their first experience of life in the mountains. They had performed very well to have reached base camp and now it was time to go back. How many would return with me as I continued my Himalayan pursuits in the years to come would be something to figure later. For now, the 7 of us who would stay back to attempt the summit bade them farewell. We slept the remainder of the day till dinner was announced at 5pm. We had to have an early dinner and then rest again till the time of departure dawned on us. We divided ourselves into two teams. One team would leave at 10pm and the second at 10.30pm. Milind, Vivek and Binod would comprise team 1. Kalpak, Ketan, Biprashish and I would form team 2. By the time dinner ended, Binod and Vivek had decided they’d avoid the summit and target advance base camp instead. Their physical state had prompted this. This meant Milind would be the sole member of team 1. After detailed discussions over dinner on our plans for the night and the climb, we retired to our tents. I stuffed my day bag with the bare essentials as I was wary to keep it as light as I could, and then tucked myself into the warmth of the sleeping bag with the alarm ready to buzz away at the appointed hour. Milind, couldn’t sleep and woke up at 8.45pm. He checked his bag, we shook hands and wished each other luck for the last leg of our journey, in the head torch illuminated cramped tent. He intended to wake up the support team and get them to exit earlier at 9.30pm. I liked his enthusiasm, his determination and his will to make it to the top. All this with multiple ligament tears in his legs suffered in the past and a problem in his right heel. His first goal would be the ridge of the mountain. And if things went as planned, he would decide his next. 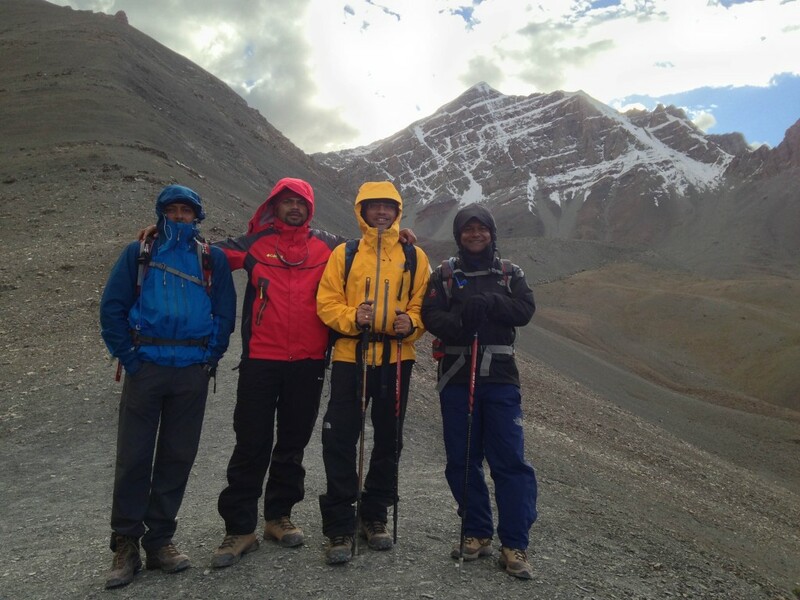 It was Milind’s first time in the Himalayas as also a part of a summit attempt. 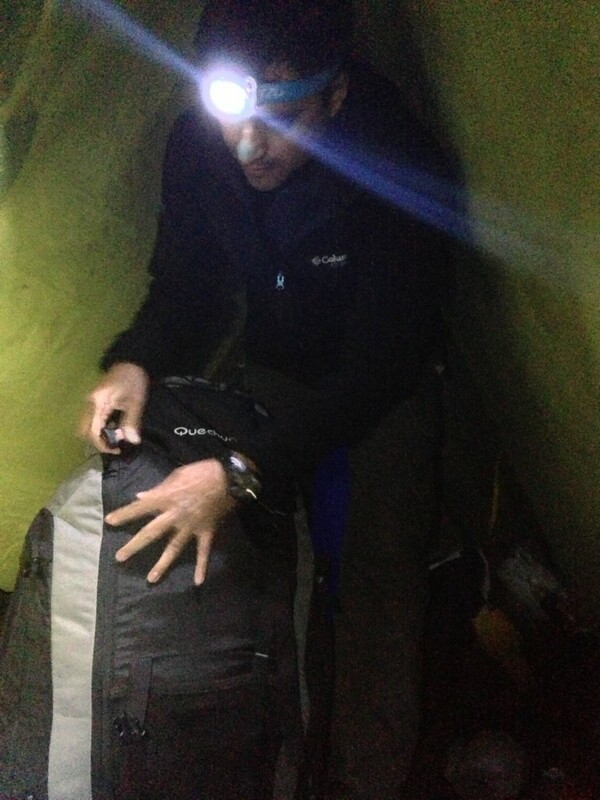 Milind organising his gear before summit departure. Very soon we had wished each other luck and success. I still had an hour and 15 minutes on hand. My self-projections were at the maximum now as I attempted a quick power nap. In my mind I had already gone past the glacier and was climbing the south face towards the sharp south ridge. The ridge apparently hadn’t taken me time to navigate and very soon I had summited. I could see multiple peaks and ranges around me. A truly jagged spectacle from the top. Cameras clicked away furiously. My moment had been captured on film. I stood tall and jubilant. My first Himalayan summit. Soon it was time. I wore my boots, heaved the bag on my shoulders, looked back one last time at the mess that was the tent and stepped out into the darkness, my head torch lighting the direction upfront. It was a clear night, bereft of clouds. The full moon shone brilliantly as did the stars around me. I entered the dining tent to activity within. Harnesses were being strapped on, hydration packs were being filled, food rations were being checked and crampons were being packed. Ketan, Kalpak, Biprashish and I were ready to leave on the biggest night of our journey. We assembled outside and stood in a single file for a photograph before departure. Chain Singh, our expedition and climbing lead did the needful. With ropes strapped onto our individual harnesses we turned ourselves in the direction of the brown hill we had ascended the evening before. We reached the top in the same time it had taken us earlier. And then we ventured further away, base camp disappearing from our sight. The narrow path was a gradual descent initially before it flattened out, with a drop on the right and the hill face to our left. In front of us, in the full moon night was Stok Kangri. She seemed so near. At around 12.30am we stopped to catch a breather and replenish our energy with a protein bar or two. Biprashish wasn’t himself tonight. Through the journey from Leh, he had been one of the stars of the team. At 49 years, he had marvellously carried on and had even drawn appreciation from Chain Singh. But tonight was different. He hadn’t had dinner the way he should have had and now he vomited his guts out. “It’s perhaps the Electral (rehydration salts) in the water”, he said. Chain Singh and I asked him to rest for 10 minutes and to let us know if he felt better. He said he was. We made him walk upfront while I brought up the rear. We had to reverse the team order for the time being. Another five minutes later, and we came to a grinding halt once again. Apparently Biprashish was drained of energy from his recent bout of vomiting. It was difficult to pinpoint the reason. Not having proper dinner would have also added to it. It was bad timing and I felt terrible to ask him to retrace his way to base camp. I didn’t want to, but there clearly wasn’t any choice. He would slow us down as well. I remember him telling me, but look she’s so close and I can see her summit. I can make it. “Dada, I replied, don’t feel bad. You’ve been terrific and have really outdone yourself. Perhaps it wasn’t meant to be. What seems close, isn’t and it will take us time to get up there. Listen to me and head back. You are my responsibility”. Biprashish obliged as instructed, as I had in 2003, and went back with the team’s runner. I don’t think he looked back and neither did I, as we resumed walking. It was his first time in the Himalayas too. Our two teams were the only ones out at night. I could see another set of bobbing lights far in the distance. That was Milind and his support crew led by Kailash. It seemed he had already crossed the breadth of the glacier and was now heading towards the steep south face of the mountain which would lead us to the ridge. The terrain had gotten worse. There wasn’t a path anymore, just rocks and lot of them. A sharp nudge here and another jab there, the movement going forward was most irritating. I hoped my shoes didn’t open up as the laces got loose; as stopping to tighten them ever so often, especially now, would mean wasting energy. This had happened earlier on many uneven stretches, until base camp. At 1.30am we reached the point when we had to cross the breadth of the glacier from the left to the right. 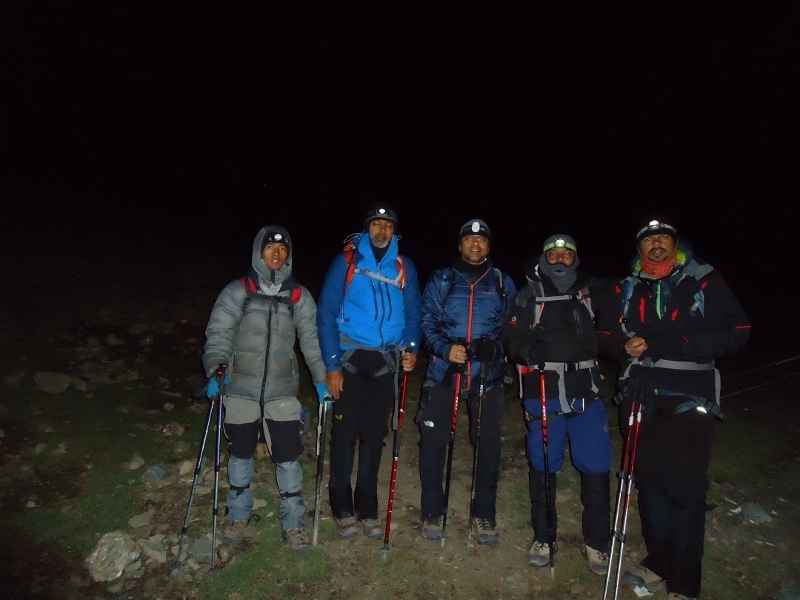 This entry was posted in Events, Latest Journey and tagged Ladakh, Stok Kangri, Stok Kangri Base Camp, Stok Kangri Summit, Summit Night. Bookmark the permalink.